Clean and wash the Dondakayalu. Cut the ends. Cut them into pieces as shown in the video. Take these pieces into a microwave safe bowl and add little water. Now cover lightly and microwave on high power for seven minutes. Then stir once and microwave on high for five minutes. By this time the pieces are cooked. You can also use the low power option in microwave for better cooking. Drain water if any. Do not throw away that water. 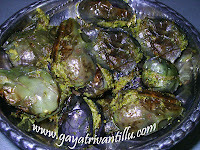 It can be used in any gravy vegetable preparation or dal preparations. Cut cashew nuts into small pieces and keep aside. Dry roast Cumin seeds in a pan. Add broken red chilies to it and fry for some more time till you get nice aroma of cumin seeds. You can also dry roast them in a microwave for one minute. Cut coconut into small pieces. Now grind coconut, roasted cumin and red chilies. Do not add any water as we are preparing a dry curry. Take this mixture into a plate and keep aside. Heat oil in a pan and fry cashew nut pieces. When they are golden in colour remove and keep them separately in a plate. Now add Bengal gram, black gram in the remaining oil and fry. When these seeds turn to light brown color, add mustard seeds and cumin seeds. Fry for a while and add curry leaves. Now add the cooked Dondakaya pieces and mix well. Now add turmeric powder and salt and mix well. Keep on heat stirring in between till the curry is completely dry. Now add the kobbari karam and mix well. Add the fried cashew nut pieces and mix. Transfer this to a serving bowl and serve hot with hot rice. This curry brings a special flavor of roasted cumin seeds. Added to this we have coconut which gives a nice taste to the curry. In the first place use very little water to cook any vegetable in a microwave. Because mostly the vegetables get cooked with the water they contain. So don’t pour glasses of water to cook vegetables. Just sprinkle few drops and cook. That would be sufficient. 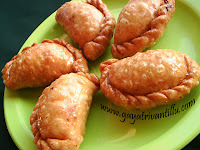 Uma here again :-) I want to know the recipe of poornam boorelu. If you have that recipe could you please let us know. Thanks in advance. Very good site to learn coocking. My husband enjoying the food prepared by following the process given in the site . Thank you very much.. I check ur recipes on regular basis. Love them a lot. You are a very powerful woman helping a lot of people living away from parents. 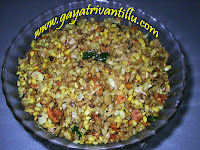 naaku vandatam tarvaatha... thintam koda raadhu ani maa amma chepthundhi.... now in an year, I learned a lot of ur recipes... India going maa mom ni surprise chesthaa ee sari...thnx a ton. May god shower all his blessings on you. have a wonderful times.